The man who landed a gyrocopter on the lawn of the U.S. Capitol Wednesday alerted a Tampa Bay Times reporter to his flight plan almost a year ago, and the reporter traveled to Washington this week to watch it happen. After the media stunt ended safely on Wednesday afternoon, the presence of the reporter, Ben Montgomery, provoked ethical questions in newsrooms about what journalists should do when they have advance knowledge of a potential crime. Montgomery was in touch with the pilot, identified as a mailman named Doug Hughes, over a period of months. "Hughes told us last week that he planned to go to Washington this week and attempt his flight," Tampa Bay Times Managing Editor Jennifer Orsi said in a statement. But the newspaper did not inform authorities of the flight plan until after Hughes' gyrocopter was already in the air. "At about 1 p.m. we called the Capitol Police and Secret Service to ask whether they were aware that a man was flying toward the Capitol in a gyrocopter and ask for comment," Orsi said. "We posted their response on our website. At approximately 1:30, Hughes landed." According to tweets from two eyewitnesses, Hughes landed at 1:23 p.m. It was a protest flight, according to Hughes' public writings, intended to raise attention about what he says is the need for campaign finance reform. Hughes first contacted Montgomery last summer after the Secret Service visited Hughes at home. At the time, the mailman's act of civil disobedience was beginning to take shape. After the visit, Hughes "decided he wanted someone to tell his story in the event he was hurt or arrested," so he "sought out a Tampa Bay Times reporter and explained his plan and motivation," Montgomery wrote. "He says he has no intention of hurting anybody and that he doesn't want to be hurt either." Montgomery's story about the flight was published shortly after noon, when the newspaper had confirmed via a live stream set up by the pilot. Orsi pointed out that "we reported extensively and publicly about our story and the flight on social media including Twitter and Facebook." 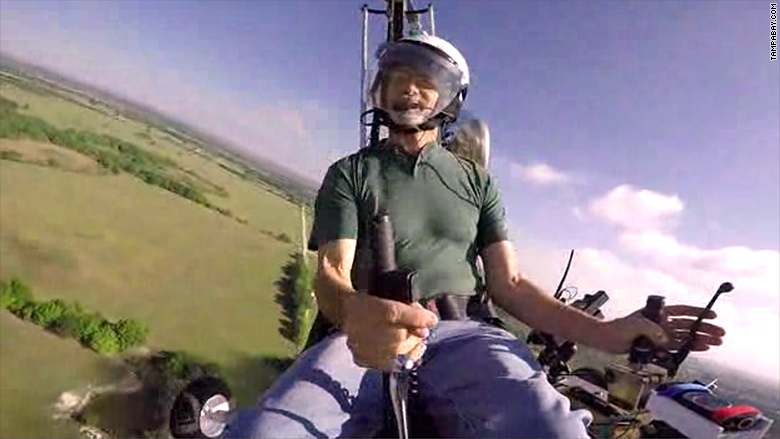 The newspaper didn't just interview Hughes ahead of time; it also recorded video of him hauling the gyrocopter into a van for the drive north to D.C.
"This is one of the craziest stories I've ever done," Montgomery wrote on Twitter after Hughes took off. "I so hope nobody gets hurt." An hour later, Montgomery followed up, relieved: "He made it down safe. Arrested immediately. Witnessed moved way back. Can't believe he made it." Reporters at other news outlets immediately raised questions about what obligation, if any, journalists have to alert authorities to potential crime. Similar questions have come up in the past when journalists have shadowed people illegally crossing a border and engaging in drug use. "I spent a lot of time with Doug Hughes over the past year and he designed this entire plan to prevent himself or anyone else from getting hurt," Montgomery told CNN's Wolf Blitzer. "This wasn't a guy who had a death wish." Montgomery added that the paper was "ultimately comfortable" that the Secret Service was aware of Hughes and felt it wasn't the paper's "journalistic job to pull the plug on his plan or alert anyone in advance." Hughes' friends were just glad that he landed safely. Michael Shanahan, Hughes' co-worker, said he was "totally relieved" to see his friend arrive at the Capitol. "I had told him time and again that they will shoot him down," Shanahan said. "And the fact that they didn't - I don't know who made that decision --- but I appreciate it very very much." When asked about the surge of media attention on Wednesday afternoon, Shanahan said, "That was the point." "It was an act, basically, of civil disobedience. He wanted to let people know about what campaign finance laws, or lack thereof, are doing to this country." Hughes had put together a live stream of the flight to Washington that was broadcast on a website called The Democracy Club under the title "Live Flight."